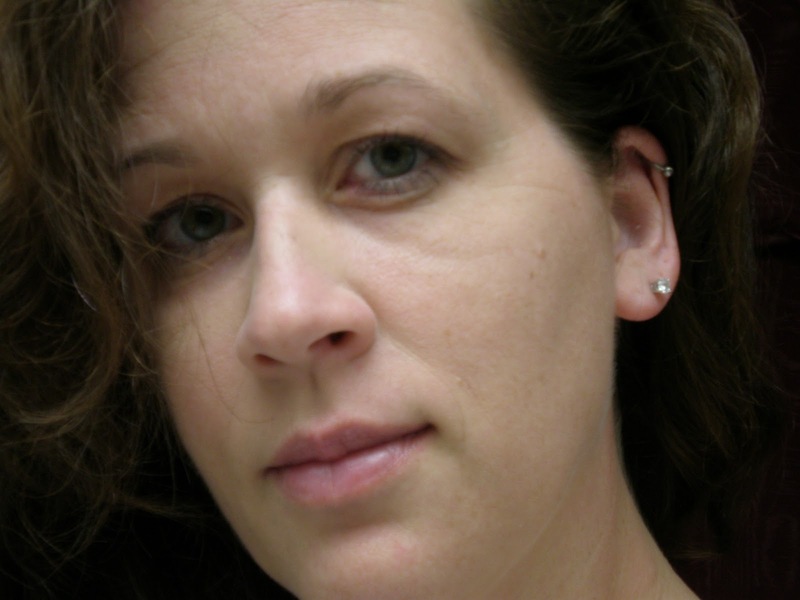 Kat Heckenbach has one full novel complete, two in the works, and a slew of (mostly published) short stories, both fiction and personal experience. Kat receives an "I took the COTT challenge" button for her website and is invited back to take the challenge again. Bio: I grew up believing I’d become a professional artist someday, but changed majors in college and graduated with a B.S. in Biology. Which led to me teaching math. (Logical, right?) Then I quit work to stay home with my son when he was born. I now homeschool him and his little sister, while writing and taking care of three aging pets. The only TV I watch is American Idol and the occasional Disney show (sigh…). I have a bizarre affection for drawing weird and unrealistic beetles. Question for Readers: Do you want immediate action in the opening scene of a book, or do you prefer to get to know the main character a little and let things build over the first chapter or so? My name is Kat Heckenbach. My blog/website is www.kat-findingangel.blogspot.com. I have been writing for a little over three years. Elevator pitch for Finding Angel: A fostered teen is transported to her homeland by a boy who has searched the globe for her. There she must rediscover her identity and her role in stopping a madman who threatens the town…and the very nature of magic. She doesn’t know where she’s from, but she knows she doesn’t belong. With no one who understands her obsession for books about other worlds and magical creatures, Angel spends much of her time alone, immersed in the paper and ink worlds where she feels most comfortable. Despite a loving foster family, and a little brother who holds the most special place in her heart, she dreams of living in a land that could exist only in the pages of a fantasy novel. Then she meets Gregor, who produces an indefinable sense of familiarity within her. The feeling comes to light when Gregor is forced to use his magic Talent to save Angel’s life, reviving her memory of an attack seven years prior–the attack that produced her amnesia and stole her from her real parents. Angel realizes she’s been given a chance to discover her true identity, one that Gregor assures her includes a magic Talent of her own. She makes the hardest decision of her life, and follows Gregor to her homeland. She experiences a world unlike any she has imagined, complete with a twisted family tree that’s rooted in a centuries’ old feud, a painting that (literally) holds the key to the truth, a mysterious and talkative beetle, and an Elven rocker who can play the songs of the stars on an electric guitar. Angel must grapple with the consequences of her decisions while traveling a path of self-discovery that leads directly to her role in an ancient Prophecy…and to the madman who set her fate in motion. What I love about writing in general: Simply the creative process. I’ve always been artistic—drawing, painting, scrapbooking, taking photographs—and this is another form of that same creative force, I believe. What I loved about writing this book: Living out my own childhood dreams of discovering I was from another place, somewhere that had magic and mythical creatures. I’m particularly proud of the unique details of the world in Finding Angel. The creatures, the Elves (one in particular with a very special gift for music) and the system of magic that focuses on each person having a special power—the way God has given each of us abilities that allow us to accomplish His work. What I’ve learned over the past six months: “Kill your darlings.” Critique partners and writing short stories has taught me to get rid of extra words. It’s quite freeing, actually, not being burdened by trying to tell more than the story. I’ve also learned that I can’t force myself to be a daily-word-count writer, and that when I get away from plotting/outlining my stories get away from me ;). My next step toward getting Finding Angel published: Continued persistence, including securing endorsers while I’m still on the search for a publishing contract. We thank Kat for sharing such a wonderful excerpt and wish her the best in her publication efforts - are you listening Kristine Pratt of Written World communications and Grace Bridges of Splashdown Books and Chila Woychik of Port Yonder Press? I really think both excerpts were intriguing. You caught my attention. Well done to both of you. So hard to choose! Both authors exhibit exceptional skill, drawing the reader into the scene with exquisite sensory detail. Both excerpts were INCREDIBLY intense, but just something about the mystery of the first kept me edgy all the way through. I am SURE both of these authors will be published soon. WOW. Both excerpts are really captivating but so very different. Hard to choose!!! NOW, don't You want to know More about the author of EXCERPT A???? STAY TUNED TO WEEK FOUR when you'll get your chance to VOTE AGAIN! The drawing for Valeria's Cross is still open by tweeting, posting on your blog or facebook or commenting anywhere during the week. Next week is round two of Most Intense Emotions and NO WIN situations. A new poll will be up! See you then. When both are such great stories and such great writers, it really hurts that one has to win out over the other. I'd be interested to know how close the battle was in this case! Being a major fan of classic literary fiction, I much prefer a little background at the beginning of a story... time to settle into the setting and story world and to get to know the character a little bit, too. Hm, see what happens when you are a late riser? Sorry folks, I slept in today and missed all these sweet comments :). Diane, thanks! I'm a weird combo of science girl and artist, and I wanted my novel to show that. Grace, I agree. I feel that I was beat out by a very cool and worthy excerpt. Best of luck to the winner! Carrie, I so agree, which is why I chose that as a question. I feel like the trend these days is to slam the reader into heavy action, to "hook" them, but it does nothing for me. I want to know WHO the character really is so when things start happening I truly care. BTW, this scene comes from the END of the THIRD chapter of my novel, so I do have a slower build at first. There is intrigue, but the action like in this scene doesn't hit, well, till now. Chila, thanks! I really appreciate the supportive words :). Kat, thanks for playing! I really enjoyed your excerpt. As for your question, I get bored if nothing truly happens right away. And I don't like having too much backstory to wade through before getting to the real plot. But a good "hook" for me doesn't have to be over the top action, it can be a deep POV look into the character's head too. Make me care about the character, but do it quickly and let's move on, lol. Great question! Definitely the opening of a novel needs *intrigue*. It just doesn't need to slam the reader into heavy action immediately. A deep POV look is a good start, I agree :). Oh GREAT question for readers, Kat! I'm an action girl. Yeah, yeah, I'm one of those modern need-to-get-it moving-fast-to-keep-my-attention people. I have a short attention span (blame it on the dyslexia), so maybe that's why I need to keep things moving, always changing. I picked up a book this week(totally based on the cover. hehe! )and was floored by the first chapter. Tell me the opening lines don't grab you by the throat. "Tomorrow, someone else will die in my bed. Someone died in it last month, which is how it came to be called mine." I'm great with books that have awesome first lines like that! And by no means do I condone boring first chapters :). I think my beef is that not ALL books have to be written a certain way, because there are different types of readers. There should be BOTH books out there that hit fast for the readers who like that, and slower starts for readers who like that. Oops! The names of the book is In the Shadow of Lions by Ginger Garrett.